As luck would have it, a meteorite frees Gamera from the rocket that launched him into space. He immediately heads back to Earth to smash up a dam. Elsewhere, three men are sent are sent by a criminal organization to retrieve a large gem that was stashed on an island during World War II. After a bit of double-crossing, the gem is on its way back to Japan when it is accidentally exposed to infrared light. It turns out the gem is, in fact, an egg. The quadrupedal Barugon hatches and soon he grows to enormous size. 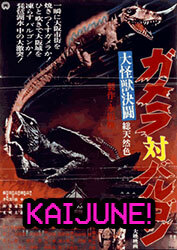 His freeze tongue and rainbow laser antics soon catch the notice of Gamera and the two square off in Osaka. Yeah, that's why we like it. 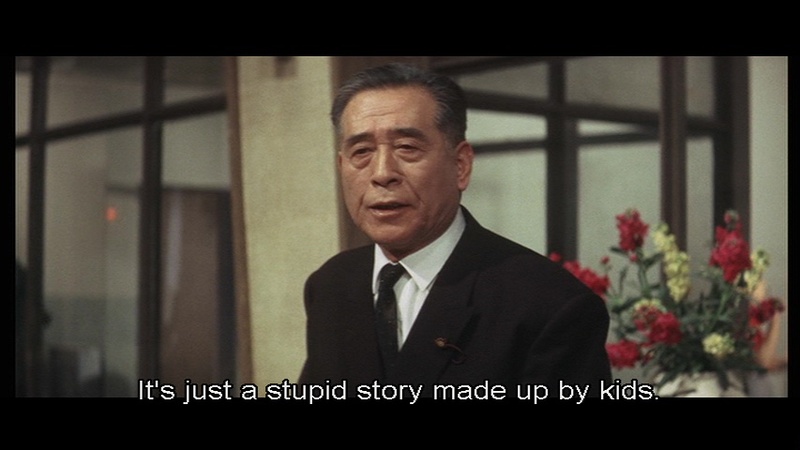 Gamera vs. Barugon is Showa era Gamera at its most adult. There are no children to praise Gamera, no forced comedy, none of the sillier elements that would come to dominate the series later on. The humans are morally questionable, many are more than willing to kill to get what they want. The monster battles are more brutal in their own cartoonish way, showing Gamera and Barugon biting and drawing blood. 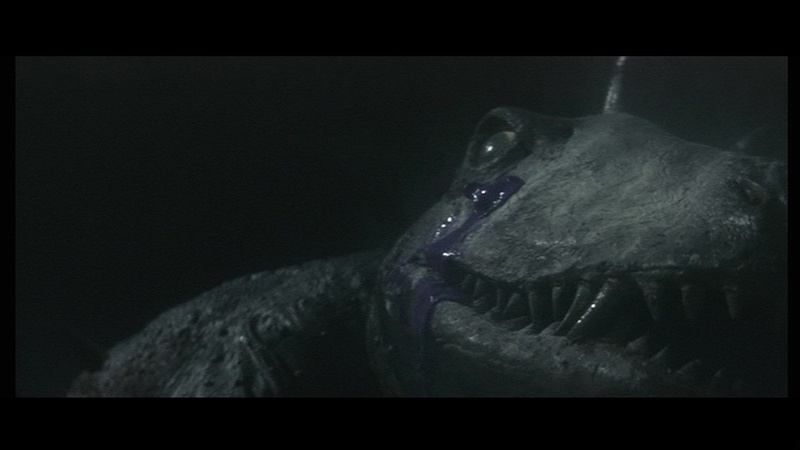 One thing I’ve always appreciated about many of the Gamera films is they treat their movie star creatures much more like monsters, they claw, fight, and bleed. Gamera has always skewed more towards horror and kid's entertainment than the Godzilla films, and that gives them a unique flavor. Gamera vs. Barugon is the first Gamera film in color and that fact is not lost on director, Shigeo Tanaka. He shoots the film with a high contrast look, starting things out with a colorful tropical island setting before the monsters battle in a moody looking cityscape. The shadows are rich and black standing out against the color. This is easily the best looking color Gamera film of the Showa era. Barugon learns that Prince has passed away. Gamera and his opponent look passable, the monsters suits are not up the standards set by Toho but they serve well enough. Barugon is kind of a ridiculous looking monster, but he’s never played for anything other than a deadly threat. He also kicks off the tradition of Gamera’s opponents being extremely strange, with his aversion to water, long tongue that sends of jets of frost, and spikes that blast a deadly rainbow. Barugon has some real personality and he deserves another appearance on the big screen some day. Gamera still isn’t quite the hero that he will be portrayed as later. Here he’s basically an animal who doesn’t like another animal in his territory. Once again the humans concoct a complicated plan to stop the monster, this time involving a helicopter and Barugon’s lust for shiny things. Gamera vs. Bargon is the best looking and most well-constructed film in the Showa era series. There is an obvious effort to make an interesting and adult film. After this point kaiju films would start to become more and more kid friendly, something that will definitely not be lost on future Gamera films.